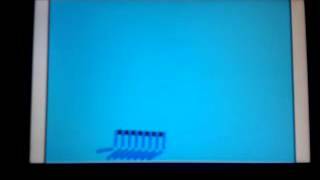 This post is result of my dissatisfaction with the awkward and contrived gait of my Robot Walker in my earlier post “Simulating a Robot Walker” in Android. The movements seemed to be a little too contrived for my comfort so I decided to make a robot which has far more natural movements. The upper part of the leg swings upward and downward pivoted at the hip. So with these rules it was easy to make the legs. The lower leg pivoted to the bottom of the upper leg through a revoluteJoint swings in the opposite direction of the upper leg between the reverse angle limts. By the way, I had tried every possible joint between the lower & the upper leg (distanceJoint, weldJoint,prismaticJoint) but the revoluteJoint is clearly the best. So now I had a horse that was ready to trot or canter around. I have carefully adjusted the mass, friction, motor speeds etc very carefully. Feel free to play around with them. Comments & suggestions are welcome. “Is it an animal? Is it an insect?”. The answer is neither. 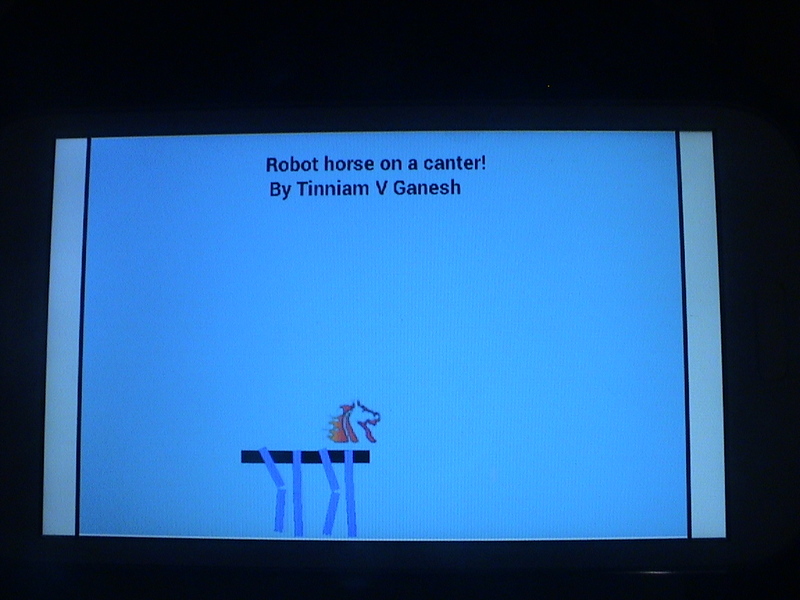 In fact it is my version of a ‘robot walker’ in android using Box2D & AndEngine. I got interested in this simulation after I saw the Theo Jansen walker in JBox2D (look under Joints) . I did take a look at the code for this but I found it difficult to follow so I made my own version of a robot walker. In this connection I would like to point yot to an excellent and a fascinating TED talk by the creator Theo Jansen himself on “My creations, a new form of life”. His creations are really jaw- dropping. Anyway getting back to my post I thought about what would make the insect walk? After some thought I realized that I had to create a swinging motion of the upper part of the leg combined with the lower leg motion which does not bend that much. 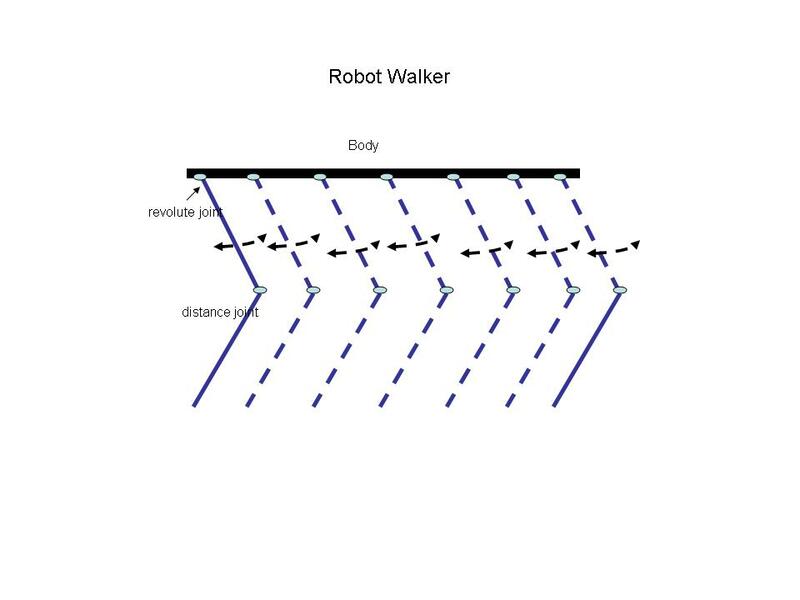 To create a walking movement I create a timer task which triggers after a delay of 1 second periodically and makes the upper legs’s revoluteJoint swing between angles within an upper and lower limit. I will probably be refining this sometime in the future. One good idea is to create a delay between the swings of different legs. Any thoughts suggestions on making the movement more fluid are more than welcome. The revoluteJoint has a lower limit of 30 degrees and an upper limit of 270 degrees. I now have an oscillating revoluteJoint which can be used in any number of ways. Finally I suspend a monkey as the last body to the Chain. I have added plated for the 2 walls (right & left) and also the floor as collisions can be detected between bodies. With all these under gravity we have a nice Chain effect! In this post I give the details of how I modeled a ‘running car’ in Android using AndEngine & Box2D physics. This post is based on a great blog post by Emanuele Feronato on “Step by step creation of a Box2D car/truck with motors and shocks”. I wanted the car to reverse direction when it collided with either the left wall or right wall. In my original code, the car body and the walls were made of rectangle shapes and I was not able to detect the collisions. So I changed the car body and add a left wall and a right wall with sprites and checked for the collisions between these bodies. 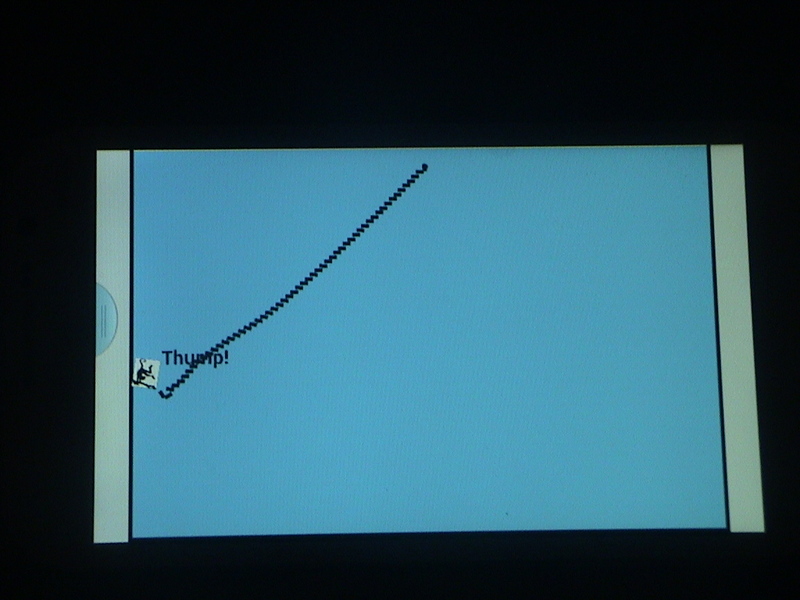 Fortunately I had done this collision detection in my app “The making of the Dino Pong Android Game”. I was able to check for collisions as shown below . If you have done all of the above and also managed to utter the magic incantation (which I will not divulge ;-)) you should have a cute running car! 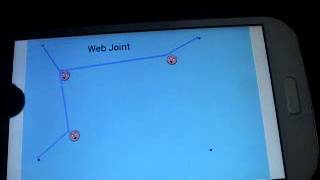 I got interested in this demo after I saw the Java demo of Box2D physics in Jbox (look in Joints). Moreover my interest in this demo was heightened as the Disney game ‘Cut the rope’ possibly uses some elements of a web joint. 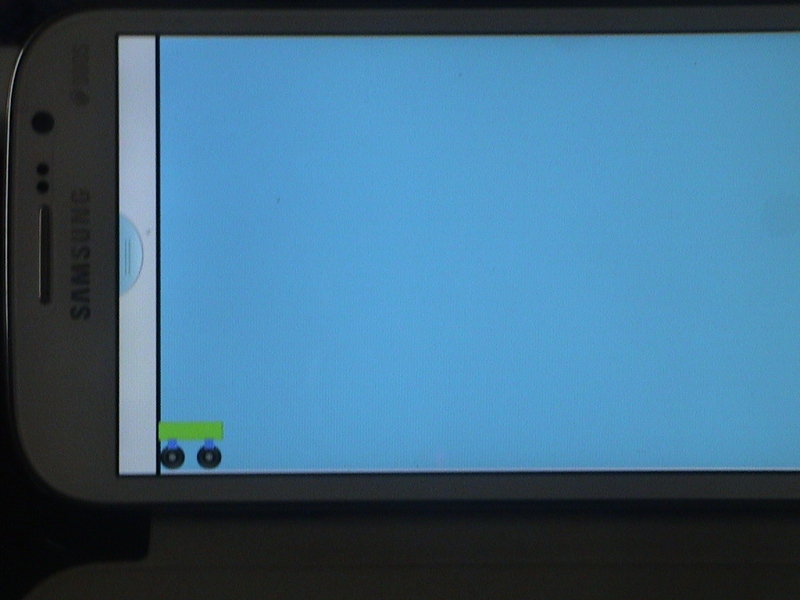 The first task was to create & place Animated Sprites(face) at the corners of a rectangle. I also added distance Joints between them. 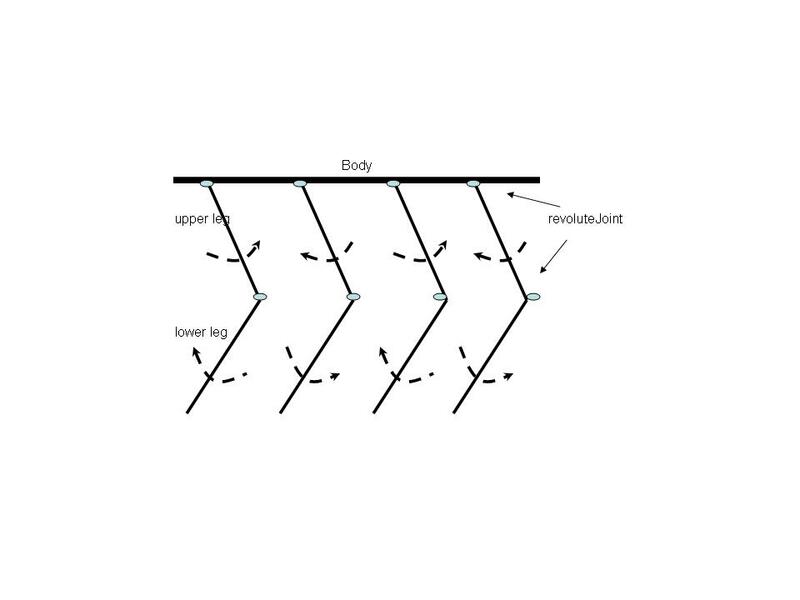 While the Animated Sprites are dynamic bodies I also created 4 pegs (static bodies) that attach to these 4 animated sprites which are suspended in a rectangle formation. 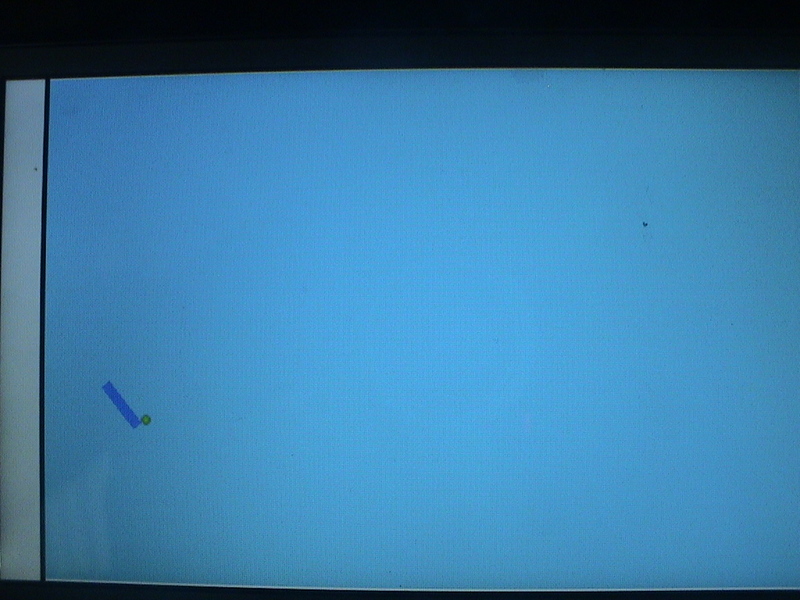 I also added a onAreaTouch listener to enable me to remove bodies interactively. This is a deviation from the demo where the user has to press a key which will remove the bodies in a pre-determined fashin. Anyway occasionally I do get a SIGSEGV in update thread if I remove face as follows lower right, lower left, upper left. Some orders work well for e.g. Upper left, lower left, lower right etc. If you figure out what I am missing do let me know. You can clone the entire project from Github at EdgeShape. Since it is a cosine curve I place a ball shape for every point on a cosine function, close to each other to seem continuous and create a body from the Sprite with physical properties. However, I am not sure how to create a irregular edge shape. I will probably figure that out. The egde shape is made to be a STATIC_BODY. I then took code of creating Animated Sprites at the point where I touch from AndEngine examples (PhysicsExample.java). To make the simulation more fun I also added a Linear Impulse to the Animated Sprite. The effect is better if the phone is horizontal to the ground and not so great if the phone is kept vertical and the bodies do not seem to shoot off.